Johann Philip Enders, known as PHILIP CHRISTIAN ENDERS, was born July 22,1740 in Breunigweiler, Palatine, Germany. On May 13, 1764 he married ANNA APOLONIA DEGAN, who was born January 12, 1746 in nearby Sippersfeld, Palatine, Germany. The parents of Philip Christian Enders were Johann Conrad Enders, birth and death unknown, Breunigweiler, Nassau, Germany and Maria Catherina Geissel, born. 1700 death unknown, Sippersfeld, Nassau, Germany. They were married June 21, 1718 in Sippersfeld, Germany. The parents of Anna Apolonia Degan were Johann Conrad Degen, born 1700 died 1752, Hesse, Germany and Susanne Elizabeth Hohmann, birth and death, unknown. They were married September 5, 1730 in Sippersfeld, Germany. Philip and Anna emigrated to America and eventually settled in Jackson Township, Dauphin County, Pennsylvania. Anna died in 1796 and Philip in 1809. Both were buried in a family plot not far from their homestead. A group of descendants organized in 1885 and formed The Enders Monumental Association. In 1980, they erected the burial monument as shown in the first image. 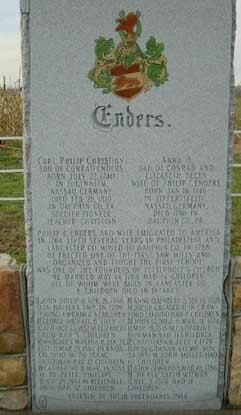 In 1984, the Enders Family Association placed the Enders memorial stone as shown in the second image (photograph courtesy of Scott Barnes). 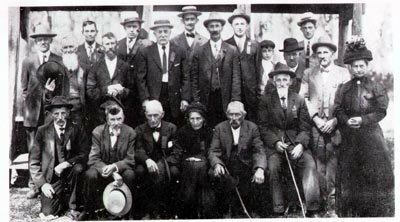 The first reunion was held September 13, 1913. The Association was incorporated in 1929 and became The Enders Family Association, Inc.